Thew new beverage honors the state hosting Sunday's big game. With Super Bowl LIII coming up on Sunday, football fans are feeling pretty peachy. To honor this year's Super Bowl host, Atlanta, the sports drink brand crafted a new flavor, but it will be pretty hard to find outside of the city. Peach Blitz, a very limited edition drink, pays homage to Georgia's signature fruit. 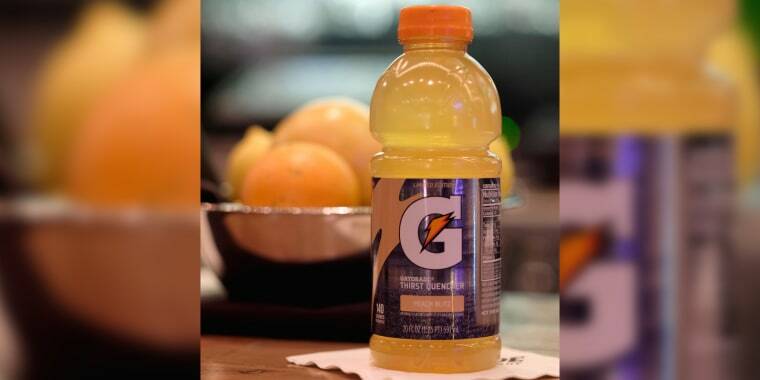 Now Gatorade fans (and possibly a few Peach Snapple traitors) are freaking out over how to get their hands on the drink because only 1,000 bottles are being made and distributed during the days leading up to Super Bowl. And the drink will apparently only be available in Atlanta — though we know limited-edition items often make their way onto eBay to appease eager fans willing to pay extra. People are pretty excited about the drink, even if they're not really into the Super Bowl. Some are willing to pay any price. Others are pleading for the brand to keep the flavor in the lineup forever. Atlanta Falcons quarterback Matt Ryan, who promoted Peach Blitz on Twitter, received requests to send the drink to his followers. If it’s possible, could you send me a bottle of it please? And at least one person residing outside the state put out a general inquiry to anyone in the area requesting a peachy delivery. Anyone in Atlanta want to mail me some #PeachBlitz @Gatorade? We wants the Peach! For those who are on the hunt for the elusive flavor (or want to get paid to FedEx it out of Georgia), there are just three spots in Atlanta where it's currently available, PopSugar reported. The official sports drink of the Super Bowl can be seen around the Beltline at 10th and Monroe at 4 p.m. on Friday and in Centennial Park at noon on Saturday. If peach fiends are lucky enough to get their hands on a bottle and don't down it immediately, Peach Blitz could also be used to make some pretty epic peach-flavored barbecue sauce.